I like pendulums. I like the materials they're made from, the various cuts that shape them, the symmetry and balance that comes from their point, but most especially I like the feel of their weight when they hang from a silver chain. The challenge with pendulums, however, is they're also rather fragile, especially at that delicate point that gives them their focus. I've acquired five pendulums to date: two of them were from a street market in Santa Monica, one was from the Jade Market in Taipei, and the last two were waiting for me at a gem and mineral show here in Colorado. When I only had one or two it was a easy to wrap them up and keep them safely tucked away in a pretty pouch or box, but as my collection grew that method no longer seemed adequate or, perhaps more accurately for this project, appropriate. I decided many months ago to build a special box to house my collection. The box part was easy: head over to Michaels and pick up a large, flat, bare-wood box for a couple of dollars. True the hinges aren't great and the clasp slants more than just a little, but those can be addressed later. What I needed was a solid, wooden frame to get started with. 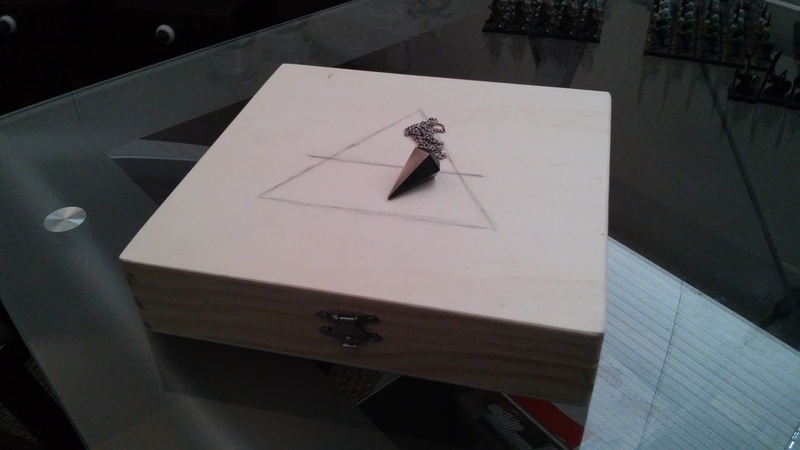 And so I brought home this box, put the pendulums in their various bags inside, and left it in a drawer for months and months. I knew I wanted to add dividers, line the interior with padded felt, and dress everything up theatrically, but what was the design? Just measure out some rows and columns and start filling them in from the top? Somehow this seemed to lack elegance and insight. And even more importantly, it didn't seem to really fit pendulums. 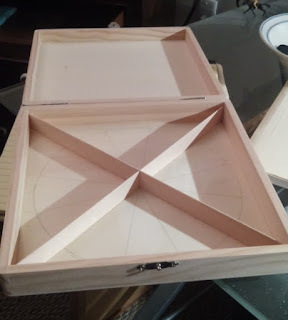 Then this past week, as I took the box out and laid all the pendulums together on it's hollow wood bottom, I realized that I needed to follow their shape. Pendulums don't belong in square boxes - inside a square their shape is an oddity rather than a natural, elegant occurance. And then it dawned on me: they belong in triangles, they belong in a circle, they belong with their tips together! The idea was so simple and yet, like so many good ideas, it took its sweet time coming to the surface. But now that it had arrived it was rather quick to execute. 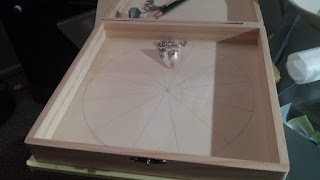 First it was a simple matter of dialing in the center of the box off the corners using a straight edge. I didn't have a compass the right size for the circle so I improvised with a loop of thread and two pencil tips to draw the circumference. From there I opted to follow a traditional 12-part division with a fifteen degree offset to place the openings of the sections square with the sides of the frame. Then a few more straight edge lines and the layout was done. Next I found some basswood planks from my stock pile and cut two long dividers to criss cross the box 3/4 of an inch high. Tilia is a wonderfully soft material to work with and shaping the top edges of the dividers into a gentle radius was a cinch with sandpaper. That, however, was the end of the easy stuff. One of the challenges of putting a circular design inside a square box is that while all the interior angles are the same, the lengths of the dividers and the angles they form when touching the sides of the box are all different. 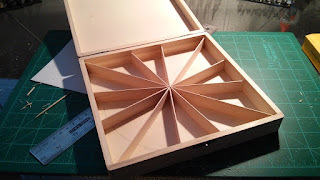 I carefully measured and trimmed to fit each divider, slowly working the angles flush to the box's interior with my x-acto knife and sanding block. One by one I improved my technique and the pieces fell into place. I was very happy with the final look and feel of the design. The pendulums seem to fit naturally in their new home and I know they are now well protected. Eventually I'll line the interior, varnish and paint the wood, and replace the hardware with something much more careful, but for now I'll simply enjoy it as it is. You are so creative! 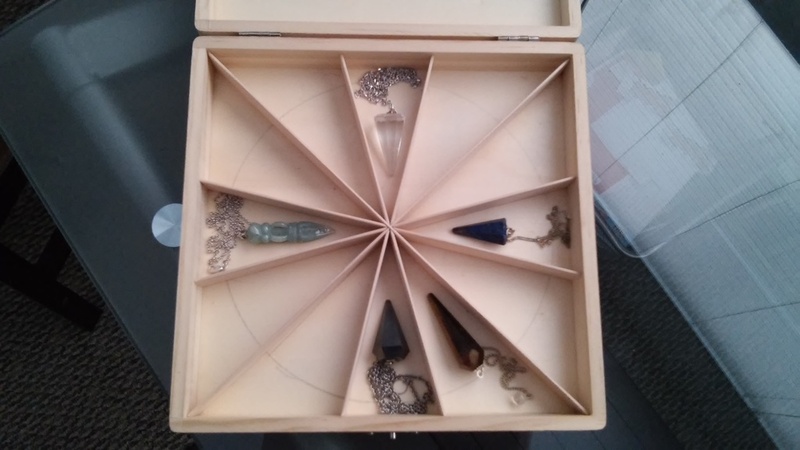 Never thought of this pendulum box in real! Your idea of making this pendulum box is something which need to be praised!